It’s been a while since we’ve made contact paper sticky wall art. 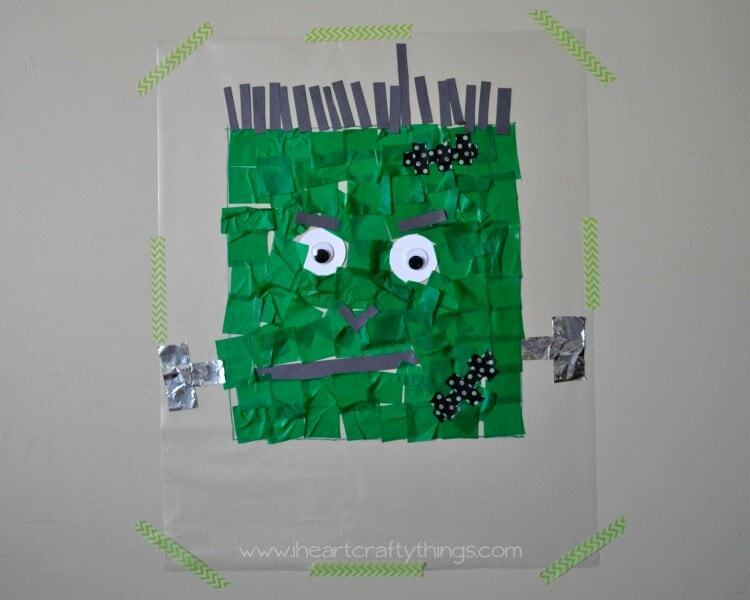 Since I’ve had Halloween on the brain, I came up with this idea to use different materials to create a Frankenstein. My daughter had so much fun and ended up with a unique looking, spooky creature. 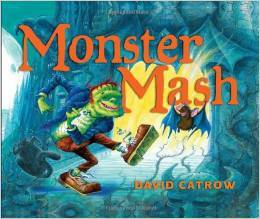 Looking for a book to go along with this book? 1. Start by cutting a piece off of your contact paper roll for your Frankenstein. Use your permanent marker to draw a rectangle shape on your contact paper. Peel the backing off the contact paper and tape it to your wall with the sticky side facing out. 2. 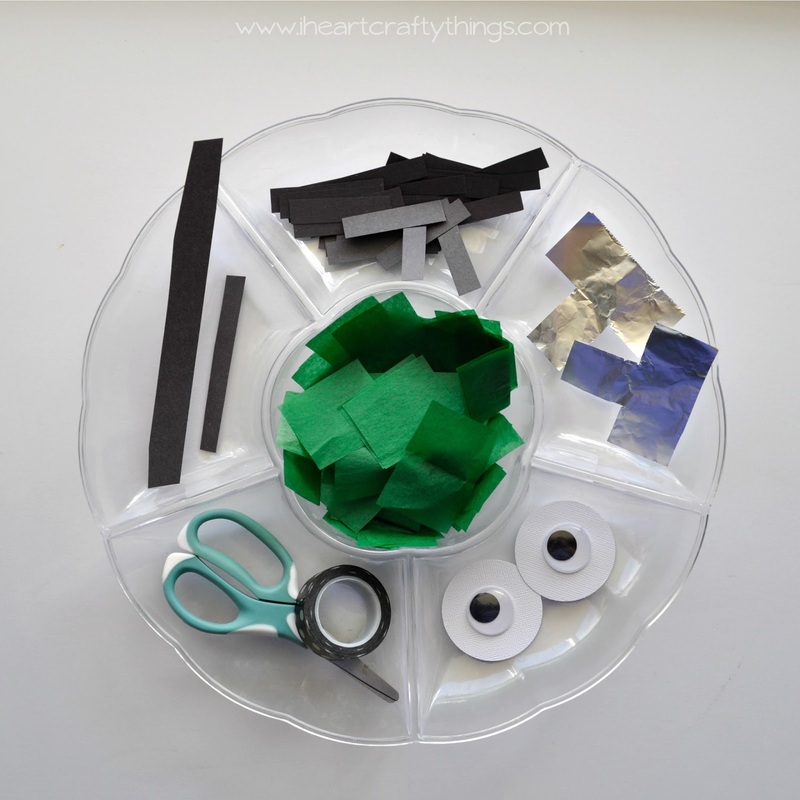 Gather your materials for making your Frankenstein. 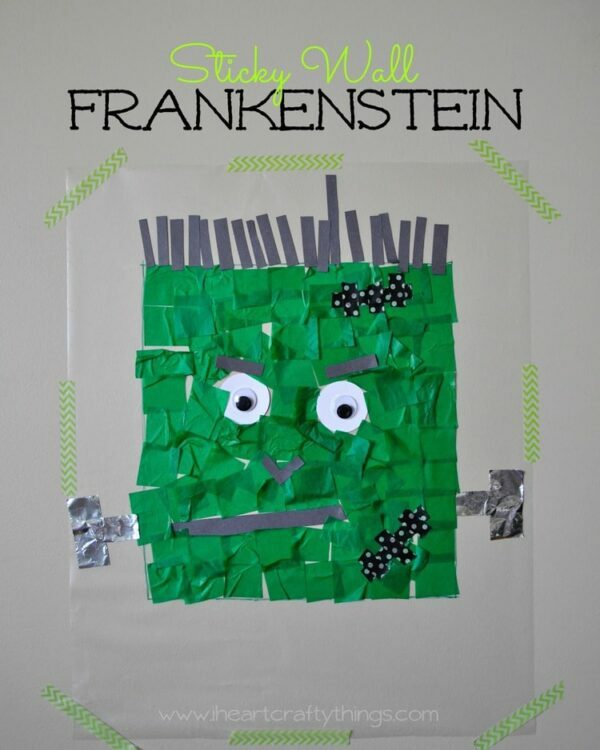 In my head I tried to envision how a Frankenstein could be put together, and I decided on these materials: green tissue paper squares, foil cut up into bolts, black construction paper cut into strips for hair and a straight mouth piece, two large googly eyes glued to 2 white circle, some black washi tape and a pair of scissors. 3. Set your child(ren) loose, creating a Frankenstein. 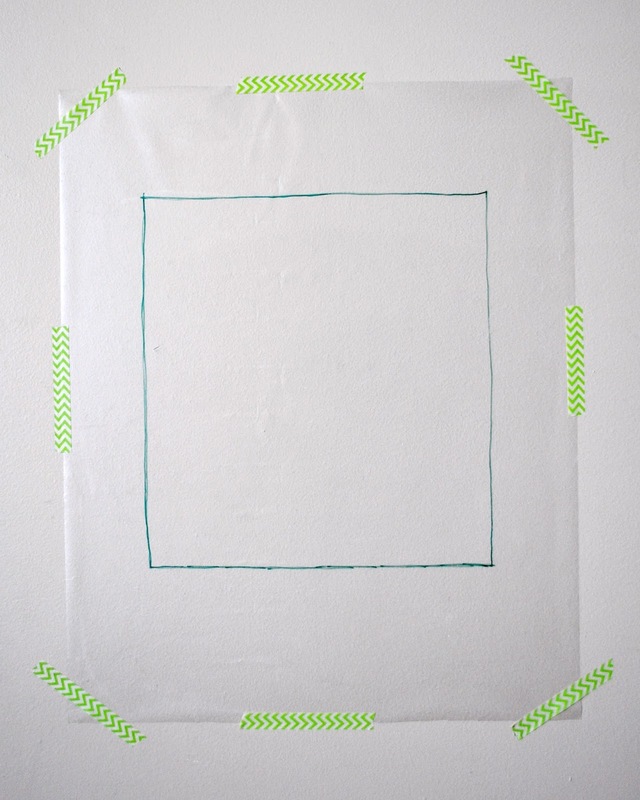 I added the rectangle lines as a guide and my daughter chose to use them as a guide for her adding her tissue paper squares. 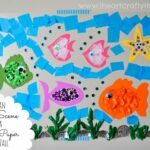 We have made lots of contact paper art so she is pretty used to our projects. Don’t get discouraged if your child goes outside the lines or comes up with their completely own creation. 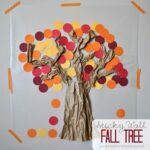 This is really set up to be an open-ended art project and that is what is so beautiful about it….Just letting your child create what they want with the materials. 5. 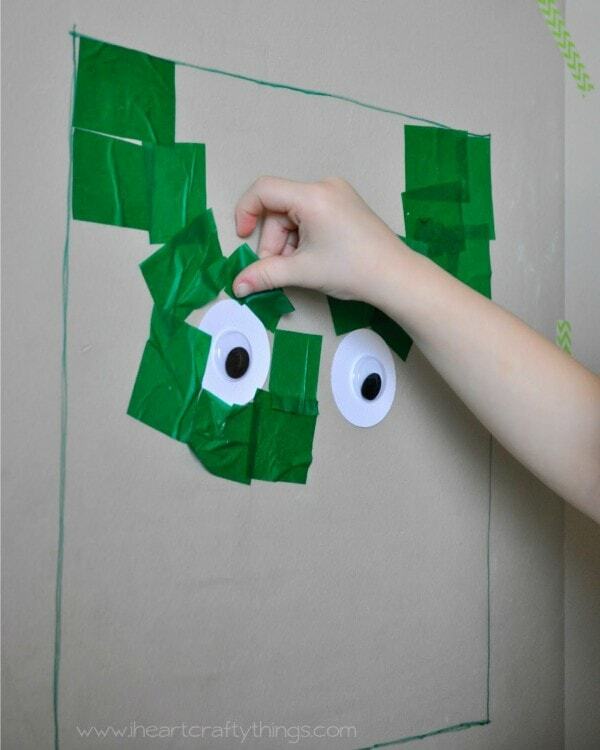 Continue your Frankenstein by adding on the foil bolts, the construction paper hair and using some construction paper pieces to add eyebrows and a nose if you choose. Our nose and eyebrows were an after thought so my daughter used a glue stick to help adhere them to the tissue paper. 6. For the scars my daughter cut and used pieces of black polka-dot washi tape. My daughter was pretty proud of her creepy Frankenstein creation! 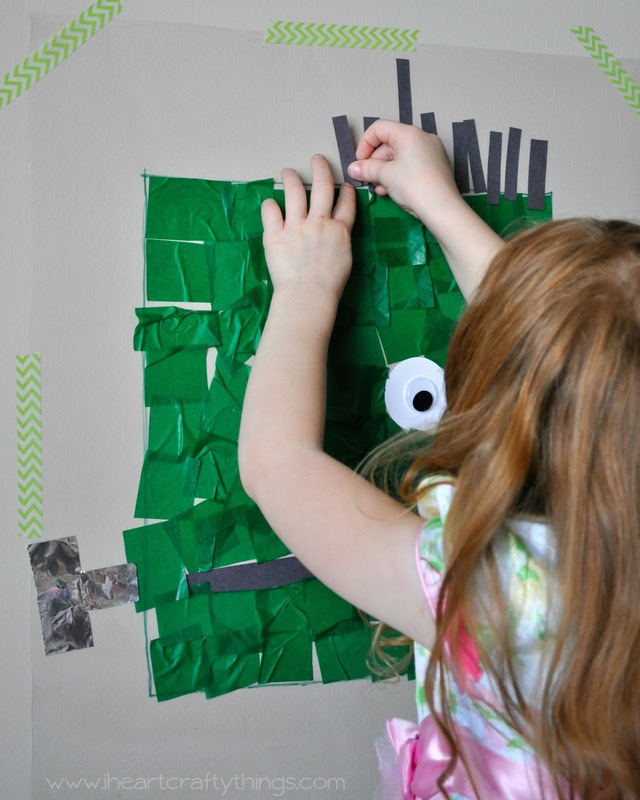 What other kinds of Halloween creations can you think of creating with a contact paper stick wall? 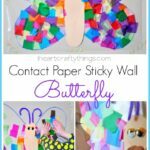 You might also enjoy our Sticky Wall Butterfly, Contact Paper Fall Tree or Sticky Wall Ocean Art!